Aaaah! Breath deeply of the fresh clean smell of a brand new Monday! It's like that new car smell, full of the promise of adventure on the road through the week! Because of a challenge I won back in August with this card, I am thrilled to be coming to you today as the Guest Designer at Stamplorations!! I so appreciate the win and the honor of serving as GD for Sketch Challenge #20! This is a one-layer card with a background paper taped behind the candle openings. The candles were cut using the Serendipity Die "Cupcake and Candle" (012ED). The letters were cut using Avery Elle "Cheers" die (D1333) and the enamel dots are from my stash of dots, mostly from My Mind's Eye. For the background design and the letters, I used a piece of glossy card stock and dropped alcohol inks and blending solution onto it and let them do their thing. I won't lie, I had a hard time using this particular background scrap because I've had it propped up against my glue bottle for weeks to admire the pretty colors. But in the end I used it for today because, as Hammy often tells me, "Hoarding should only be practiced by hoars." You can't argue with that. The Design Team has brilliant inspiration posted on the blog today! I hope you will have a chance to play and I can't wait to see how you interpret this fun sketch!! 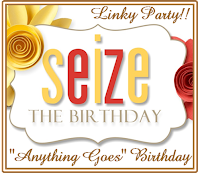 I am also playing in the Seize the Birthday challenge (no topper, although my candles look good enough to eat! ), the Simon Says Stamp Wednesday Challenge to make our own background, and the Pixie's Snippets Playground challenge to use up those snippity scraps. Just click on the links to the challenges for detailed information on rules, sponsors, and prizes! You will also be treated to lots of inspiration from the design teams and galleries! BTW, big CHEERS to my friend Jim, otherwise known as Irish Cherokee (Love The Details), on the occasion of his birthday today!!! I hope you have a wonderful birthday Jim and many, many more!! Five more lovely and talented friends are here today waiting to meet you! Penne Norris of Wee Craft. Penne, I see that you started your blog to share your cards and leave a legacy for your grandkids in January of this year, but then you stopped after only a couple of posts. Thank you for following me; I'm delighted to return the flavor! I hope that you start up again one day and let me know when you do! Cybil Lynch. Cybil doesn't have a blog, but she is a huge friend of many of our blogs and leaves lovely comments throughout Blogland! Cybil, if you ever do start your own blog, please make sure and let me know! Nikki of Nicnakschat. It's hard to look past Nikki's blog header of two of her absolutely adorable young sons to see her equally adorable cards! Nikki has been blogging since July of 2009. Her cards truly are tons of fun and I have nothing but admiration for her to be able to mother three little boys and manage to make cards and blog! Gail Iona of Crafty Nomad. Gail, who also answers to the name of Iona, is from Norway. She started blogging in November 2012 and in addition to crafts, she loves rabbits, chickens, and gardening. Iona is mostly a clean and simple card artist, but she can make some incredibly colorful and layered cards, too. I know you will enjoy her fun blog and her interpretations of the many challenges we all enjoy! Marianne of Marianne's Cards 'n Stuff. (Ha, it was hard for me to type stuff without misspelling it schtuff!) Marianne started blogging in April of 2011. She is a Dutch native living in Greece (Crete) and she has been crafting for many years. More recently she has become addicted to stamping and card art. Marianne is an award-winning challenge participant and I love her impeccably made clean and layered style! I'm delighted to have you follow me whether or not you have a blog, but sometimes the thumbnail information does not link me to you in any way whatsoever, blog or no blog. I would love it if you left me a comment or an email at the time you join to save me lots of time searching the Giant Intertube for information to welcome and introduce you, which I enjoy doing. Thank you! The NBUS Challenge ends on September 25th. Please make sure you are checking the rules under the tab at the top of my blog. A big thank you to all who have entered!! Since the entries are now over a hunnert, I have increased the prizes from five to TEN so you have better odds of winning! You know what - for some unknown reason I have missed your post for the WOOF winning card!! Don't know what happened for me to miss it!!! And now I have your darling WOOF standing (I mean sitting) in it's special place on my desk!!! So a late congrats at WOOF being nr 1 in the challenge and earning you a GD spot!!! And your GD card is just soooo cute, Darnell!!! Love the happy CHEERS and the candles - such a lovely and clever take on the sketch!! Love the colours and the enamel dots as a finishing touch!!! Lovely card, Darnell!!! What a creative and fun take on the sketch! I am also proud of you for using that gorgeous background paper instead of hoarding it! Should follow your example! Oh, and congrats on your GD! Darnell this is such a FUN card, those candles are so much fun and Jim is going to love it!! Happy Monday! Hi Darnell, Well done on your GD. I thought your beautiful background was a printed paper! no wonder you admired it for so long but how wonderful to make it into a card for your friend! Congrats on your DT spot...and great job with the sketch. You made by day, and I KNOW you made by hubby's day with your shout out. Means so much...thanks for all your kindness. Hope you have a really special week. Congratulations on the GD. Am I blushing? Thank you for the birthday wishes from a special friend. Happy to have made it this far. Love your card. If it were real and had all of the candles required it would burn the house down. LOL. Well, at least it would warm up the house nicely. LOL. Ooooh, congrats on guest designing... clever use of the sketch. Like how your mind works. Would never have thought of candles but the card is lovely. Clever interpretation of the sketch! Well done on being in the GD spotlight. Beautiful card and great interpretation of the sketch. BRAVO Darnell, very well done!! Love your take on the sketch - it's so clever! Congratulations on the win and GD spot - very well deserved IMHO! Love this clever card Darnell, I can see why you just wanted to look at the pretty colours. I have had alcohol inks for years but I've never even opened the bottles (hangs head in shame)! Awesome, awesome card, Darnell! We're so happy to have you over as our guest at STAMPlorations! That background is beautiful -- glad you chose to use the background scrap instead of hoarding it and depriving us of one of your fun cards! Hope you have a great week! Wonderful design, Darnell. Love the inky background. Congrats on the guest designer post. I love this Darnell, a great design, love it! Congrats as Guest Designer and what a neat sketch. The card is delightful and a little different for you - good job. Oh this is so cool! I love the die cuts with the background information. I love what you did to create this card. Bright and cheery and awesome the way you added the letters in with the same color combo too. And, how you got the enamel dots to match so well is perfect. I don't think I would have been so lucky in that respect. So, yes! I do indeed love this design. Congrats on your guest design spot, Darnell. This is a great idea for the sketch. I love that background paper, too. I think that sketch might have floored me, so well done on making such a great card using it. i love the alcohol backgrounds. they are always so pretty. How cool! Now I have to go see if I have a candle die! Love it! I love this great idea, and it is so effective, and lovely. Such a brilliantly designed card. I LOVE the way you have created the background colours, I really must give that a try. I am glad you took Hammy's wise advice! This is so cool how you used negative die cuts and staggered those candles - wonderfully creative - so great to have you as GDT! What a wonderful card and a great idea! Colours are awesome. Congrats on your GDT spot, Darnell. Congrats on your well deserved Guest DT spot! You are so creative, Darnell! I LOVE your background so much! The colors are so pretty, and look fabulous peeking through the negative space of the candles! Love how you played with the alphas, too! Hammy is a smart boy...and, I'm so glad you shared this pretty creation with us! Fabulous GD card for the sketch! Love how you made it your own! Oh dear, I'm a hoar! LOL! It's wunnerful to have you as GD at STAMPlorations, Darnell, and I love your fab interpretation of the sketch. That paper would have been propped up on my desk forever, just so's I could look at. Congrats on your GD spot Dippy.....so well deserved with that "doggone" card!!! Love this one with the positives and negatives.....very clever. Love the vibrant colours you have used. Soooooooo happy to have u Guest Design for us and what a beauty u created, that alcohol inks have done such a magic :) so pretty ! That should be always listen TO Hammy lol! Congrats on your GD spot! Great take on the sketch and love the letters between the candles. Thank you also for your lovely comment today! I love this card Darnell. Wishing it was my birthday soon! Perhaps I should be like our Queen and have two just so I can have a card like this one! Well done on the GD Honey. So pretty! And what a great way to interpret the sketch. Congrats on the guesting! A fabulous interpretation of the sketch, this is a lovely card. I love the pretty alcohol ink colours you used. Congrats on the GDT spot. Brilliant Darnell! love the design of your candle card with the pretty alcohol inked background. The enamel dots match so well and finish it off perfectly. Hammy is such a wise and knowledgeable little fellow, I never knew that definition! What a clever crafter you are!! Brilliant way to use the sketch and I can understand why you didn't want to use the background, the colours look gorgeous! You've inspired me so much that I'm going to try this challenge myself for the first time. And thanks for mentioning Jim's birthday, have just popped over to wish him a wonderful day!! Congratulations on your GD spot too! Hi, Darnell! This card is just adorable! Who wouldn't want to receive it for their birthday?? Congrats on your GDT spot; I loved seeing this beauty over there. Such a creative use of the sketch! Beautiful design! Love this Darnell, you took this sketch to another level! Great interpretation and huge congrats on the GD spot! I love this card! The alcohol ink peeking through the die cuts is so clever! What a great take on that sketch! I looked at the sketch and thought, well how would I use that sketch and have it not look "choppy" but you did it beautifully!! Well done. Oh, and congrats on the GD! Thanks for the shout-out, Darnell. You made me blush with your description of my crafting lol. Wonderful card and such a fun take on the sketch. Forgot to say congrats on your DT spot. I love this Darnell! How clever to pop the coloured card behind the cut outs - super result! Congratulations and congratulations again, Darnell. For the winning without water and for the GD spot. I knew that dog was a winner, such character! Love the look of alcohol inks, I'll have to try them one of these days. Great to know that you can always count on your wise hamster :). Congrats on GD. You deserve it and I love the card you made, too! So very clever! Enjoy your week! Congrats!!! This is a brilliant take on the sketch. And I'm still laughing at Hammy's comment about hoarding! I've used NBUS twice since you started #2, both for upcoming DT stuff that I can't share. DOH. But I'll get there! This is such a creative take on the sketch. Love how you worked all those colors in. Congrats on your GD position. Such a creative card! Love those colors behind the candles too! Thanks for sharing your talents with us at Seize the Birthday...it's a pleasure to stop by and see what you have been up to! Congrats on your GD spot!! You and hammy are just so clever!! This card apart from being quite unique is amazing!! Beautiful candles, Darnell! I tend to want to hoard and look at some of those backgrounds instead of use them. This was a great way to use those pretty colors! Much more special than solid candles! Congratulations on your GD spot! Well deserved. I LOVE your gorgeous card. Wonderful colours and I love how you coordinated the enamel dots. That Hammy is very wise, lol! Note to self - Hoarding could ruin my reputation!!!!! Fabulous card Darnell and how fun to be the GD too. Your work is always so fun and so refreshing too. CONGRATS!!! 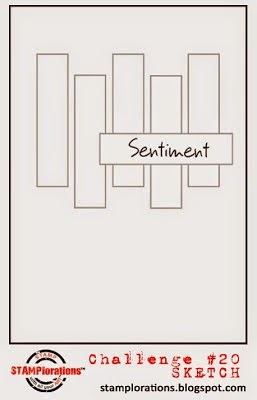 Love the composition of your card.... actually, its pure GENIUS! Such a fabby card for your guest designer spot. The paper you've used behind the cut outs and the enamel dots match each other perfectly! Such a clever idea, and love the background colours. Very cool! Big congrats, Darnell! Your card is so creative--love it! How thrilling to see you as GD at STAMPlorations - and your card is totally brilliant! Way to rock the sketch! Love it oodles! Love your take on this sketch - it looks so good!! Cool how you diecut the candles and put that cool paper behind!! You did a really cool job on this card! !